As a group the Ark Two Community Newsletter members purchased 500 of these kits and from this project were able to give some support to the Ark Two Legal Defense Fund. The supporters of the project donated up to $100 each for a kit (although there were dozens of people that had no money and to whom we had to simply give detectors for free). Even then we were able to distribute only a little over 400 kits, so little interest was there in nuclear survival. The balance had to be taken over by a distributor so that we could complete the agreement to take the 500. The distributor eventually sold those off at $160 each but while writing this I checked the prices and I found that an equivalent kit would now cost over $1,000 - so we really got a superb deal. There were 14 items in each kit. I explain about all the pieces in detail with the following pictures, so that people who got the kits can understand what they have, and you can learn how to use similar equipment. This was a GREAT deal. How it came about is that the Ark Two organization got to do a bulk purchase by buying out everything that was in the old Admiral operation in Canada. Admiral had done the testing, repair, and manufacturing for all the government and military items in Canada. When they closed that division these were what ended up in the warehouse. We had to take everything - but we got a super, super deal. The two bigger devices are Canadian IM 108/pd. 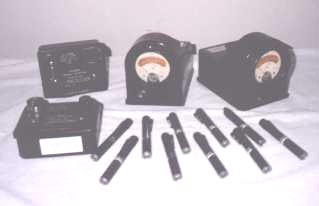 Radiation Meters designed for use in a Nuclear War situation. The two middle sized units are PP 5120 / PD Chargers. The ten smaller items are the dosimeters. Most likely they will be a 600R IM 5013/PD but you could receive a more "expensive" model. Something I will discuss under their individual picture. All the models work on the same principle and will equally well do the job. but I include them in the discussion so as to give you an overall comprehension of the subject. The dosimeters will probably come to you in little individual boxes. We got them in cartons of fifty with the little boxes inside. Most of the cartons have never been opened and the dosimeters are in their little boxes and are sealed in cellophane. Each and every dosimeter has its personal serial number so you can keep track of their use without getting them mixed up. The key to this whole program was the dosimeters. We got the dosimeters so cheap because while lower rate ones are priced at $185 each no one sees any use for the higher rate ones because they don't believe there will be a nuclear war. 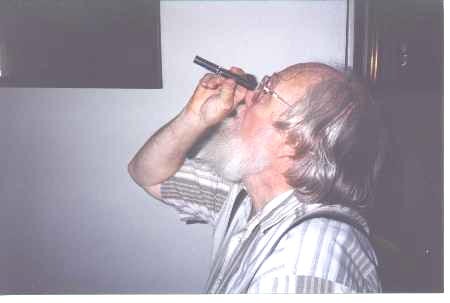 The way we "read" a dosimeter is to just point it at a light so that we can look through it and see the scale. It is a hairline that moves across a very clear well marked scale. Much easier than reading a thermometer. 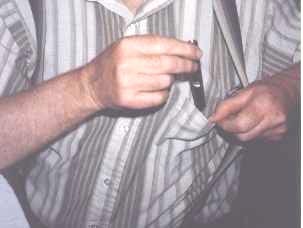 You can wear the dosimeter like a pen in your pocket, but they are actually designed to clip onto your belt and to be worn at waist height. However, you can put it anywhere. Stick it in your ear if you wish. Put it in a brown paper bag and set it outside for an hour. That will then tell you the radiation rate, just as if it were one of the radiation meters. So you don't HAVE to HAVE a radiation meter if you have a dosimeter and are not in a hurry to find out the rate. Also you don't have to go outside each time to measure the rate. With one radiation meter (or dosimeter) inside and another outside you can tell the PF (Protection Factor) of your shelter. After that you only need to use an instrument inside the shelter to measure the radiation and you can multiply that by the PF to know the radiation outside, without going out to measure it. Also, if ten or a hundred people are together or going somewhere, only one or two of them need to wear a dosimeter. So long as they all stay together, the radiation dosage that one gets will be what they all get. It is nice to have two or three, so that you can use one to check the other and make sure that they are working. The whole idea is to keep a record of each person's exposure. If someone has gotten 10R and someone else hasn't then perhaps let the other person do the task that has to be done outside, such as carrying out the human waste, or clearing an air vent. Children and women of child bearing age are usually exempted, because radiation is exceptionally harmful to them. 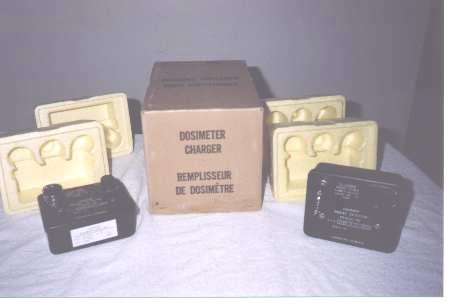 The Dosimeter Chargers will probably come to you in a Styrofoam packing box. So far as I know, all the ones that we got were brand new and had never been used. The PP 5120 / PD Chargers were built by Canadian Admiral. The reason there are two in the package, is again in the unlikely case one isn't working. The Lord has designed everything in pairs. You have two eyes, two ears, two nostrils and so forth. It is a good plan. The Lord's plan. I will go with that. Years ago I bought civilian Bendix kits, that had the exact same device in them, but I am told not built to the same high battle standards. We only had two devices in the kit needing charged. Here you have 10 dosimeters to be charged. Enough to split up in two groups if you wanted to, and in this way each group would have a charger. The little chain has the lens cap dangling off it. 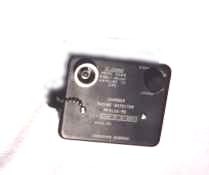 This is what you use, when you aren't using the charger, to cover the hole that you look down through with the dosimeter to charge the dosimeter. The dosimeter charger requires one standard everyday "D" cell battery just like you use in a flashlight. But CRAZY AS IT MAY SOUND not all brands of "D" cells are the same size. Some are a tiny bit too large and won't fit. So MAKE SURE that you store a battery with your charger that DOES fit. Store the battery with the charger but NOT in it. There is a thumbscrew on the back that allows you to open the case, but I prefer to use a screwdriver. 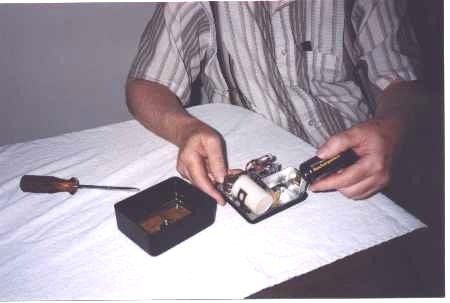 While you have the case open you will see that there is a spare flashlight light bulb mounted inside. It is for just in case the light bulb burns out. This is very simple to do. All you have to do is remove the contact cap, (like a screw on lens cap) put the dosimeter on the contact and press down. This turns the light on inside. Then you look down through the dosimeter and turn the knob until the hairline on the scale is on the zero. 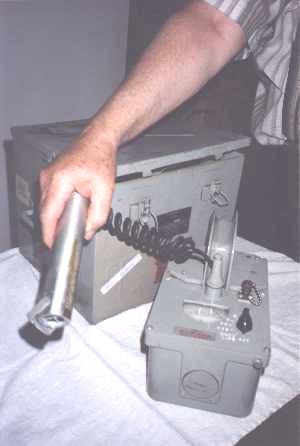 You have then "zeroed" and "charged" the dosimeter and it is ready to start detecting radiation. While I say it is simple - it does take a little practice and skill. a. You must press down hard enough for the light to come on. b. You must press down STILL HARDER to get PAST the spring load. c. You must NOT press down so hard that you bottom out and ground out. One should never use the charger to read a dosimeter's reading. 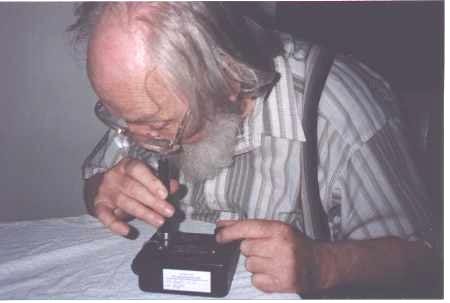 By doing this, you run the risk of pressing down too hard on the dosimeter and wiping away the reading! You don't have to zero a dosimeter every time someone uses one. This is because their measure is cumulative. One person might go out with a dosimeter and get an exposure of 15 rems (Radioactive Equivalent Man) and then another person could take it and go out and come back having it read 25. This would mean that the second person got 10 rems. However, it is best to always re-zero a dosimeter when someone else uses it. 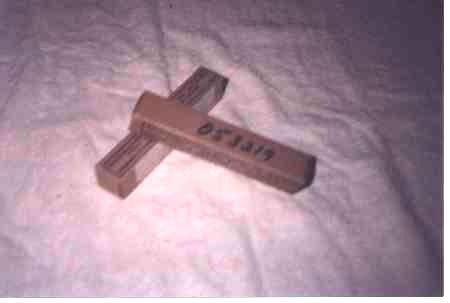 Everyone should ideally have their own dosimeter and daily (or hourly) written records of their dose, because in the stress and confusion of a war situation mistakes are even more likely if people go about sharing dosimeters and trying to sort out doses subsequently. Additionally, virtually all dosimeter manufacturers recommend that dosimeters be re-zeroed long before they reach maximum scale for better accuracy. One other point. Dosimeters 'drift'. Some will hold their charges for days, but others will start to drift after a couple of days. It is best to check out your dosimeters ahead of time, so you know how the ones that you own hold their charge. No need to get shook, just because your dosimeter has drifted. Same model in olive-drab paint is US IM174/pd. both have pseudo-logarithmic scales in r/hr 1,10, 100 500.. Parts interchangeable. These things are built like a tank. HEAVY. Very, very strong and durable. Designed to be used out in the field under the most arduous battle conditions. They go up to 500 R. Radiation can go higher but you had better be inside a shelter and NOT even THINK about going out even for a moment at above 50R. At 500 R you will have signed your own death warrant in an hour. This is the ideal meter to have during a nuclear war. I am not aware of anything similar being built for the civilian market. Civilian peace time standards are so low (that is low R - in another sense they are so high - meaning that you are permitted to receive so little radiation) that any meters built today for peace time use are practically useless under wartime conditions. There is a "Circuit Check" position. The meter should rise to the "circuit check" area on the meter scale. There is a "Zero" position and "Zero control" The "Zero Control" should be able to zero the meter when in that position. We sampled the units and found them to be in excellent condition. We found only about 3% to fail. That is actually a very good reliability rate. The reason you want two, is to make sure one is working. Three would be even better. That way you could take a "vote" between them to decide which one wasn't working. But with two, just always believe the worst case. In fact, I highly recommend that you multiply by 4 what shows on the scale. The ionization chamber in these things grows tired over the years. We have tested them and that is what we have found to be the usual ratio. NO PROBLEM. Knowing that fact still gives you complete confidence in them. You just have to do the multiplication. The actual numbers are not that important. Knowing the presence of radiation is. Knowing whether it is increasing or decreasing is important. From that point on a general feeling of range will be sufficient. If there is radiation that this unit is detecting - you need to be in shelter. While every unit should be individually calibrated, it would cost you about $40 each to do so. Therefore I have sought to solve the problem by redundancy. I think this is a good solution because it gets the equipment, with a substantial degree of reliability, into the hands of many, many people who would not have it otherwise. The advantage of rate meters is that they tell you IMMEDIATELY. A dosimeter will measure the same rate - but it takes it an hour. You can use your dosimeters to determine over time the accuracy of the functioning of the rate meters. All you need is a regular flat edge screw driver. Maybe in a pinch you could use a table knife. It uses only one battery. The battery is a regular standard "D" cell like you find in any large flashlight. Common as can be. The unit is shipped without batteries and should be stored without a battery in it. The unit is very simple to use. Only two switches. An on/off switch and a toggle switch that you can toggle to see if there is adequate battery power and to zero the unit to show that it is working. NOT INCLUDED in the package, but I include the pictures here so as to give you an overall picture of the subject. 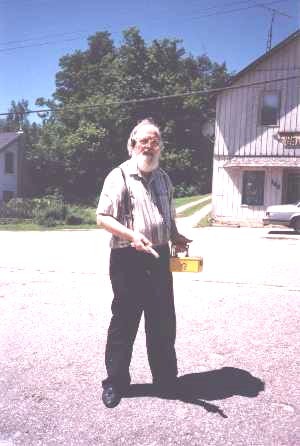 Here I am walking around with a lower range detector. It is the Universal Atomics CD-700 No. 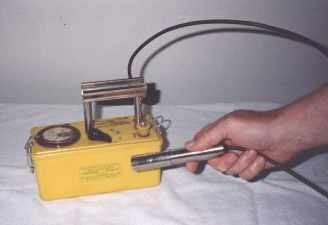 4 Radiation Detector. You may not be able to see it, but I have a headset attached to my ear so that I can hear it beep. This allows me to look where I am going without having to stare at the meter. I tell you more about this meter under photos number 12 & 13 & 14. The wand with this particular unit is designed to get as close as possible to an item you are inspecting. However, with most other units you want to carry them at approximately waist height. That is because that is where they are designed to be used. Higher or lower and they will give a misreading. A person's vital organs are at that height and that is what is essential. Lower down you will get a lot more radiation. It is especially bad for small children, because they are so short. And you CERTAINLY don't want to sleep on the ground, even when the radiation measures very low, because you will get a full body exposure if you do. On your left is a Victoreen Model 710B and on your right is a Universal Atomics CD-700 No. 4 Radiation Detector. Both of these have a low scale that measure in milliroentgens per hour. This is useful for civilian work and post nuclear recovery. The probe on the one unit is particularly useful because one can cover it with a condom and immerse it in food or liquids like water. Because the instrument is so sensitive it can detect whether or not the food is safe for consumption. I would like very much to have included an instrument like this in the package but the cheapest that I can find THAT WORK are usually several hundred dollars and I have no idea as to where to find a thousand even if people were willing to spend that kind of money. The new modern one that I admire costs $2500. As I say - I admire it, but I don't own one. If you can, find a CD V700 model 6a by Victoreen, this is probably the best of the CD V700 series and parts are still fairly easy to come by. The Victoreen 6b would be a good second choice. They are pretty good for 40 year-old devices although they really aren't all that sensitive by contemporary standards. Having said that, those that are working properly and correctly calibrated are very accurate within their range. Also, remember that the Geiger-Mueller tube is a consumable component. It has a filament -- just like a light bulb -- and will burn out in time. It's good to keep a spare. The 710B requires odd batteries which are expensive and difficult to find (although Radio Shack can get them). Also, it is not very accurate at its lower range. The Admirals I have told you about are by far the most reliabile. 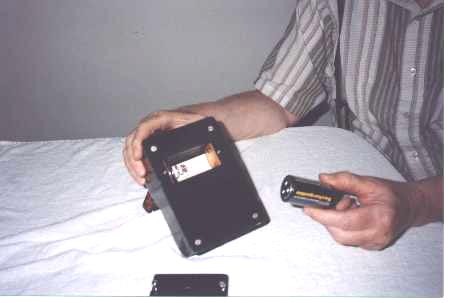 The American CD V715 or CD V717 (with remote probe capability)both use a single D cell. The problem is finding a reliable supplier. In the sample that we tested in the warehouse 100% of the CD V720s were completely scrap and only 20% of CD 715s could even be repaired. None of the CD V717 worked out of the box - but 80% were repairable. One thing that is very important to know about the CD V700s and most other true Geiger counters is that the device can/will "saturate" in a high level radiation field and give a FALSE ZERO!!! Never rely on a GM type counter to measure war radiation levels. Both the Universal Atomics CD-700 No. 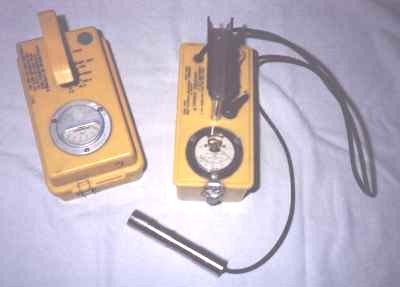 4 Radiation Detector and the Victoreen Model 710B (as shown in this picture) and also the Navy unit shown below, have switchable scales. If the radiation reads off the scale then you switch up to a higher scale that reads up to 10 times or 100 times higher. This makes these meters useful as an all-round meter. I just wish they were not so terribly expensive, so that everyone could have one (or better yet - three). In this photo you can see the switch that switches up the scale. This Universal Atomics CD-700 No. 4 Radiation Detector has a radioactive source on its side. Seems to work just as well as it did when I got it decades ago. I suspect that it is a Cesium source with a half life of 150 years which means it would probably be working about half as good, (which would be plenty good) a hundred years from now. Anyway, it is a very low source and one could probably keep their thumb over it full time without it hurting them. It just goes to show how sensitive this meter is that we use this source to test it. 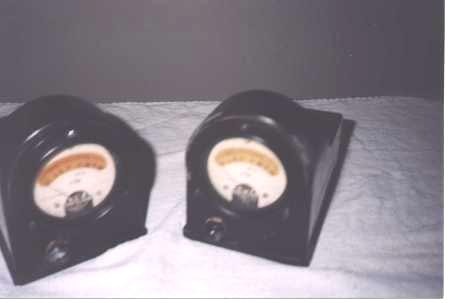 We personally use this source to test our other very sensitive meters - like the surplus Navy meters below. The US Navy PDR-27F Nuclear Submarine Radiation Detector was a great find for us. It is so sensitive that it detects cosmic background radiation from the stars. When the Chernobyl accident occurred it was able to detect radiation fallout over Canada 8 days later. Just a super device if you could find one (which I am sure you won't be able to) and could afford it. We have modified all of ours to work off of 120v house current, because the old Navy batteries were impossible to get. You have to be a very dedicated user to put all this kind of effort, love, and care into your radiation detection equipment. You should have seen the performance we had getting them into Canada. "THIS is war materials" (Oh Horrors). "You are not allowed to bring them in." They aren't destructive. They don't hurt anyone. They just detect radiation. But still you couldn't believe the battle, and you would have thought that I was a terrorist! What I have shown you here is about defense. Not about destruction. The military is about destruction - not about defense. The package that we are talking about can truly save your life and the lives of many others because of the knowledge that you will have using it and the advice you can give them. Radiation is tasteless, soundless, and invisible. Only with the these tools can you save peoples lives from it. The instruments that you have in the package are completely adequate, in fact ideal, for use during a war. You need more afterwards, like I have been showing you, during the recovery period, but what is in the package is wonderful. They cost the government thousands of dollars. I just wish everyone would have taken advantage of the opportunity.